Those palm trees are beautiful, and until they start making a mess in your pool, on your sundeck, and around your property. But palm trees grow really well, obviously especially in Palm Desert, but they really only need to be trimmed when the oldest fronds on the tree have turned brown, dry, and are dead. As palm trees grow, new fronds are formed every year and then the old ones die. Trimming should not be necessary for than once or twice per year. First, identify any of the old or dead leaves called fronds. You'll want to only remove old fronds, flowers, fruit, or hazardous limbs. If you remove anything beyond that, it can create and narrow hurricane cut that's not that good for the health of the tree. But don't worry, even if you do cut as in the images here, they will grow back pretty rapidly as long as you don't top the tree. If you can't remove the entire tree it's best not to top it because they just won't continue to grow and they could be susceptible to pest and disease. For really high palm trees, it's best to contact a tree removal specialist. Depending on how tall it is, those that are 30 feet tall or short are usually cost between $100 and $400 and those 60 feet or taller between $200 and $1200 per tree. 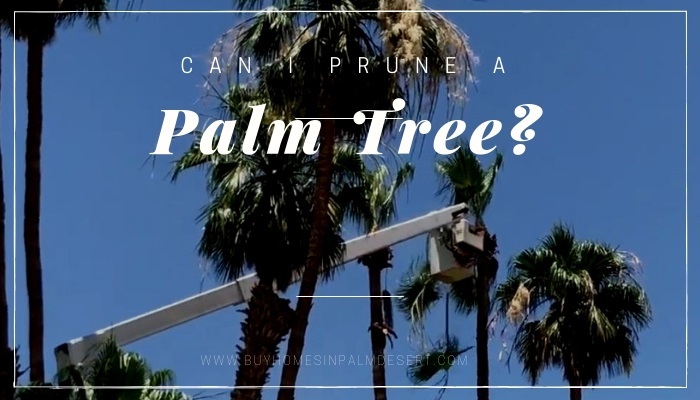 Most of the time people will prune or trim their palm trees if they are overhanging a swimming pool and you're getting fronds in your pool or around your sundeck, lining a driveway, or if you're planning on selling your property. Most buyers want a clean, fresh look to the house and dead, dying or falling fronds just don't look that attractive and can be hazardous if all one. You certainly don't want anyone touring your property to be hit in the head with one of those big fronds. They are quite heavy. It also depends on the type of palm tree. Some like these skinny ones in the image are getting a "hurricane cut", or "pineapple cut". Because they shed their fronds so frequently it's okay to give them a rather severe haircut is the fronds will come back quickly. Larger palm trees should keep the full tree crown intact, which preserves its natural beauty and helps it thrive throughout the year. Only trim away dead or dying fronds that drooped towards the trunk. For more information or for a tree removal service in the Palm Desert area give me a call today. Ready to list or sell your home? Let's talk!